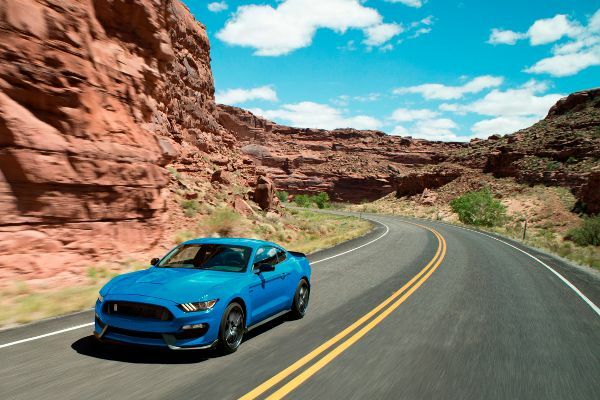 Ford presented the updated Shelby GT350 & GT350R models, in honor of National Mustang Day. 2018 models the most track-capable, street legal Mustang ever built. Ford Motor Company announces Shelby® GT350 and Shelby GT350R Mustang will continue for 2018, available in showrooms this fall. The new models will be unchanged from the 2017 versions, but the three new exterior color choices (Orange Fury, Kona Blue and Lead Foot Gray). 2018 Shelby GT350 and GT350R Mustang standard equipment includes the 5.2-liter V8 FPC engine with 526 horsepower and 429 lb.-ft. of torque, as well as engine oil, transmission and differential coolers which perfect on the track days. In addition upgraded braking system with vented 15.5-inch two-piece front rotors and six-piston Brembo® calipers along with the MagneRide™ damping system.